Chip Kelly’s near-term college job prospects dimmed last week. Never mind the former Oregon coach may not formally be looking while working in an ESPN studio this season. In a lot of people’s minds, Kelly is the best coach not to be on a sideline. In fact, his name surfaced this week as a possible replacement for Butch Jones at Tennessee. But if and when he returns to college, Kelly would come with newly defined baggage thanks to the ongoing FBI investigation into college basketball revealed last week. It has been almost 4½ years since Kelly was sanctioned by the NCAA after he had left for the Philadelphia Eagles. He was slapped with “failure to monitor” in the infamous Will Lyles affair. Even worse, Kelly was handed an 18-month show-cause penalty — basically in abstentia — after he went to the NFL. 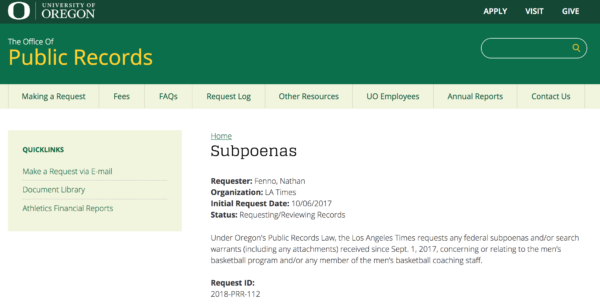 Oregon was accused of paying $25,000 to Lyles, a shadowy 7-on-7 coach, in exchange for his guiding players to the Ducks. Lyles admitted as much. That’s basically evidence of the same third-party influence Adidas was accused of engaging in by the FBI by paying college basketball assistants to influence players to sign with the shoe giant. While that sort of college basketball culture has been entrenched for decades, the NCAA is desperately trying to keep it from filtering into football. Tagged Chip Kelly, Dana Altman, NCAA violations. Bookmark the permalink.